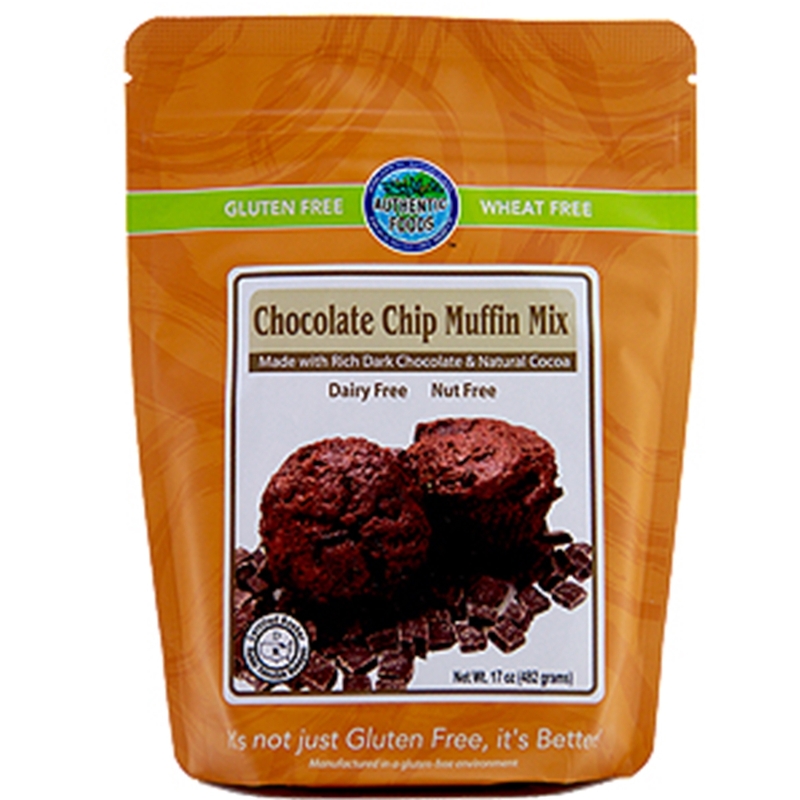 Made with only the finest ingredients and the best quality chocolate, the Authentic Food Chocolate Chip Muffin Mix makes it easy to whip up great tasting gluten free chocolate chip muffins in no time. Muffins made from this mix are great for breakfast, any get together, or just to satisfy your healthy sweet tooth at any time of the day. This mix makes 12 chocolate chip muffins or 24 mini chocolate chip muffins. Ingredients: Chocolate Chips (granulate cane juice, unsweetened chocolate, cocoa butter, sunflower lecithin, vanilla), cane sugar, cocoa, rice flour, potato, tapioca, baking soda, psyllium, cellulose, salt, vanilla powder, cocoa butter, Leavening (monocalcium phosphate, monohydrate, dicalcium phosphate), natural chocolate flavor. Preheat oven to 350° F. Lightly grease the bottom of each cup in a standard muffin pan, or line with paper cups. 1. In a bowl, beat the eggs and water together until thoroughly blended. 2. In a separate bowl and using an electric mixer along with the wire whip, blend the flour mix and butter together. Add half the egg mixture and blend at medium speed. Add the remaining egg mixture and the cinnamon if using, and blend until smooth. Fold in the chocolate chunks. 3. Divide the batter evenly among the muffin cups, using a spring-release ice cream scoop if available. Bake for 20 to 25 minutes, until firm. Leave in the pan for 5 minutes, then transfer to a wire rack to cool completely.